The GO-A3-PW Air Powered Gate Opener generates a constant speed of 8.5-RPM, and a power output of 2,700 ft-lb. The WORKMASTER® GO-A3-PW Gate Opener is an air-powered Hopper Car Gate Opener on a wheeled-cart with manual control of both its pivot wheels (to follow traveling gate), and height adjustment (accommodates varied height capstans). Railcars with varied height capstan / gate mechanisms. 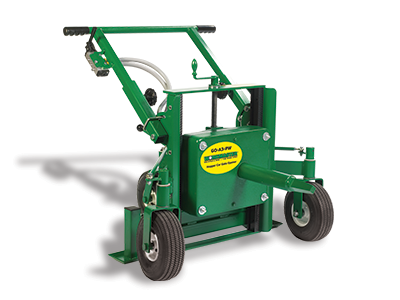 Simply and safely counterbalances the torque reaction that occurs when opening or closing gates and improves maneuverability. Easily adjust to the correct height and angle for operator preference and safe usage. Push/Pull valve allows pneumatic tires to manually pivot 90° to follow capstan movement on traveling gates. Heavy-duty, bolt-on, 1-piece construction to guarantee long service life. Operates on only 18.5 CFM @ 90 PSI (120 PSI Max) to provide energy efficient force output at a constant RPM. Operates at 83 dBA to accommodate for noise restrictions at plant and unloading site operations. Easily compensates for differing height gates, or variations in unloading site decks or platforms. 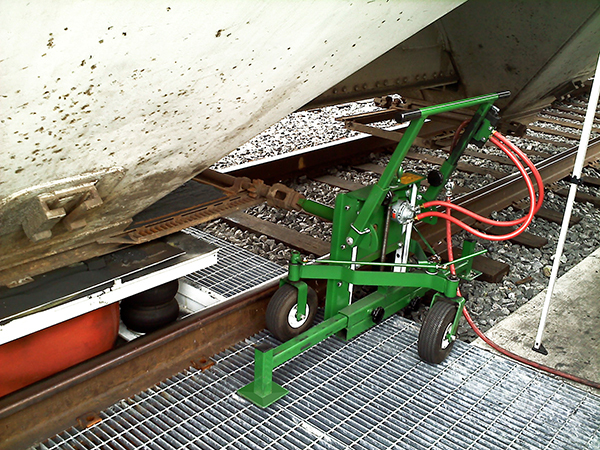 Economical option to meet a tight budget when a wheeled cart gate opener is required.